Pencilpix by Sue Clinker: 22/10: DAY OF REST! We've had a busy but productive few days. Monday we made the ferry crossing to Calais to stock up on wine and other goodies for the Winter - it makes a nice day out for us as we always have a 'picnic meal' on the return journey with lovely French bread, pate, cheese and red wine. Hector the horse was approved by his Mum so on Tuesday we delivered the portrait as my client lives fairly close to family members who we then visited. We always buy a few cases of wine for Mum and her friends (life in their retirement complex is quite social and jolly) so we delivered those and then went to check on Mum-in-Laws flat and met the carpet fitters who came to measure up for new carpets for the new owner .... if the sale ever completes. I really don't understand why property buying/selling takes so long in the UK. The flat is empty and our buyer has no chain but its been 3 months and still the legal bods are dragging their heels! Yesterday I finished the graphite portrait I started weeks ago ... for various reasons he was put to one side so it was nice to have him finished and approved. He'll be packed off to the RAF squadron's base at the weekend for hanging on the Mess Room wall and I should be getting photos of the next one fairly soon. I'm told he is on a diet at the moment and wants to lose a few lbs before having his photo taken/portrait drawn! This morning I've had a visit from a lovely man with a beautiful cocker spaniel. He wanted me to photograph her and draw her in pastel as a surprise Christmas present for his wife. She was just gorgeous, so friendly and excited to meet me. She was a bit wriggly and not easy to photograph but we got there in the end. She'll be on my drawing board in a couple of weeks' time. Next up will be tabby & white cat called Toby - another Christmas present. I'll start her at the weekend as tomorrow we're accompanying Mum to hospital to have a cataract op so that will eat into most of the day. Dang! Think I just lost the comment I typed to you. I just said that I like the RAF portrait and that you are rocking the commissions right now - way to go, Girl! At least they help pay for the wine! Can't wait to see the Cocker portrait! Thanks Jennifer. Blogger always seems to make photos look 'fuzzy' for some reason - this looks much sharper in real life. Never mind! 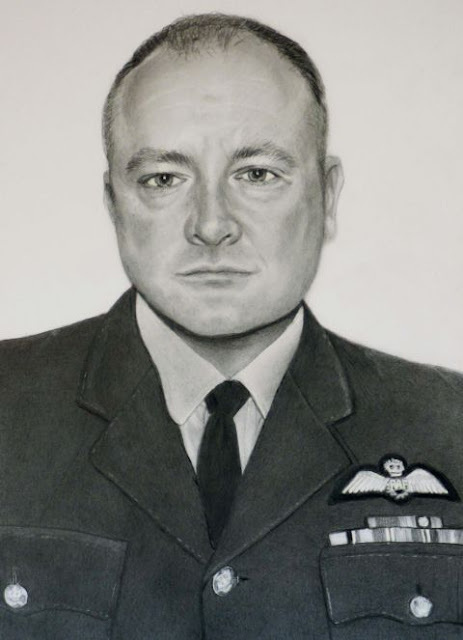 I'm having fun with these RAF portraits .... so nice to get back to basics with graphite/pencil drawing and no colour sometimes. Aren't computers 'the pits' at times??? Don't envy you this dental work, but glad it's going well. Love your RAF picture, I feel as though I know him. Envy you your booze run to France. Used to love going over but never did it for the same reason. Son in law used to say they were going for brass rubbings and dummy me, I thought he really meant it.